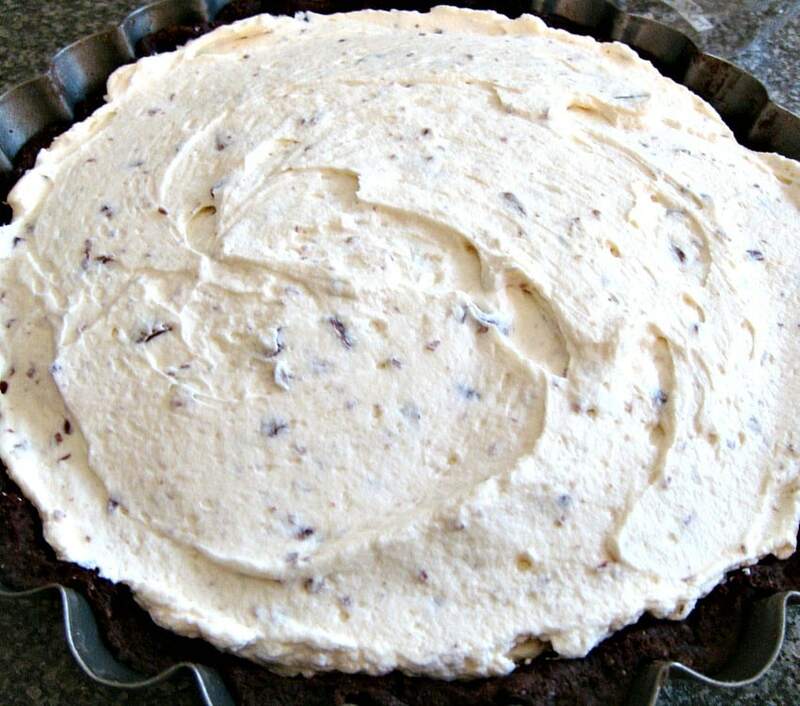 Silky Irish Cream Pie... A wonderful chilled, creamy dessert inside a chocolate pie crust. Delicious! Perfect for St Patrick's Day and all holidays! 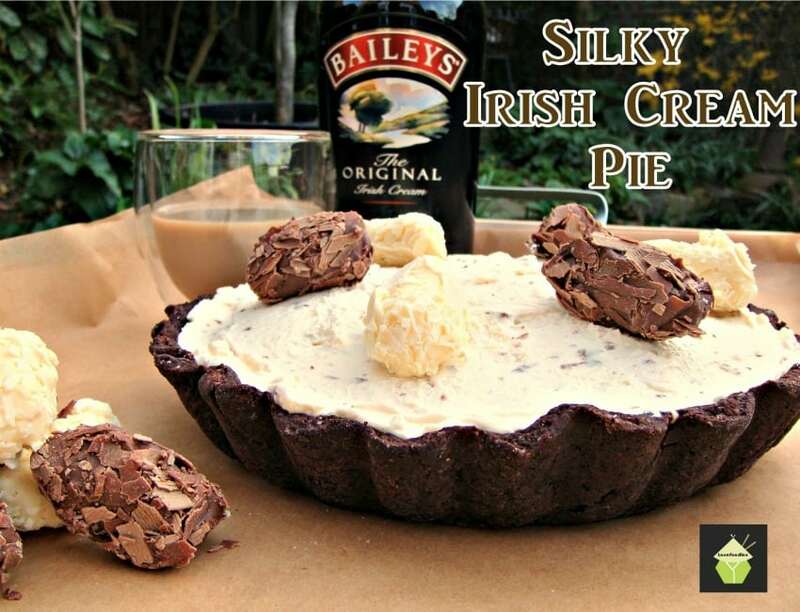 Silky Irish Cream Pie… A wonderful chilled, creamy dessert inside a chocolate pie crust. Delicious! Perfect for St Patrick’s Day and all holidays! Silky Irish Cream Pie! Oh this is so good! 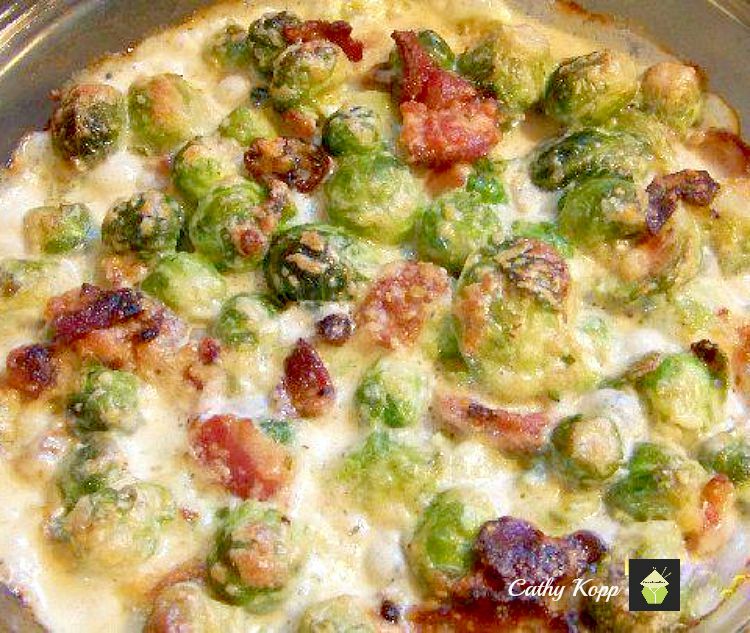 This is a lovely dessert to make for St Patrick’s Day, Easter, Thanksgiving, Christmas or indeed any time of the year! 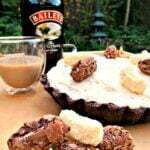 Here I made a silky luxurious Irish Cream Pie, using a variety of ingredients to make any chocolate pie lover smile! 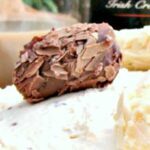 I made a chocolate pastry base, lined it with white chocolate and then filled it with the most luxurious, creamy filling, infused with Irish Cream and laced throughout with little milk chocolate bits. All in all, it is a most wonderful dessert, with different textures and taste sensations, and contrasts of colors. I decorated the top with some luxury Irish Cream truffles, just for fun! Of course, you can be as wild and extravagant as you wish, and decorate with all kinds of things. I hope you will enjoy this as much as I have done. It really is quite sublime! 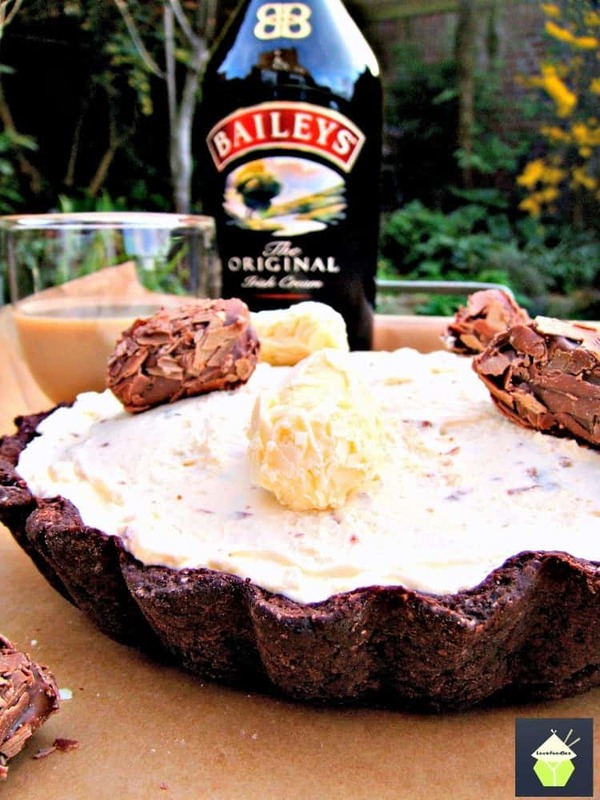 So let’s get straight to the recipe and see how we make our Silky Irish Cream Pie. Please enjoy! 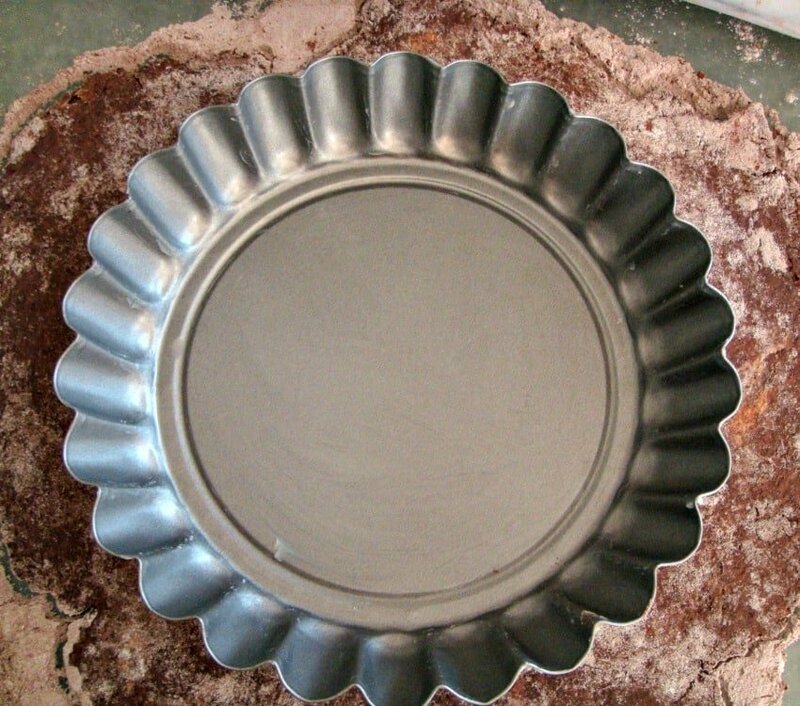 You will need a flan/quiche dish measuring 23 cm / 9-inch diameter. 1/2 stick (2.5 oz) or 75g butter at fridge temperature, cut into small cubes. 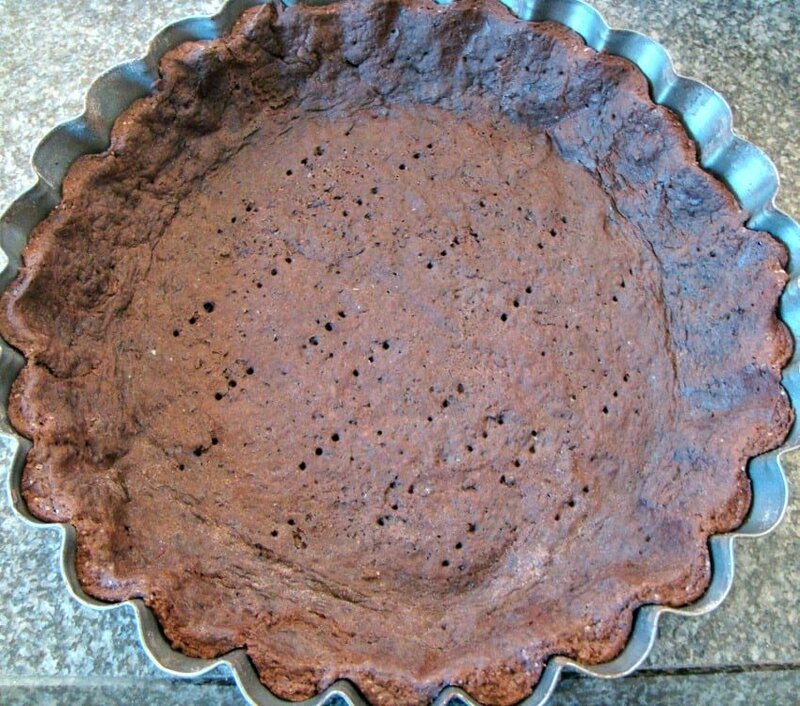 *** If you don’t want to make the base, you can buy a ready cooked 9-inch pie crust, try and get a chocolate one if you can. It makes all the difference! 2. Make your shortcrust pastry. Click here for instructions. You need to add the cocoa powder and sugar to the mix. 3. Grease your flan dish & make sure you grease up the sides too. 4. Roll out the pastry into the shape of your flan dish. Make sure there is enough to reach up against the sides of your dish. I just place the dish over the pastry to see if I’ve rolled enough. 5. Use your rolling pin to transfer the pastry to the dish. 6. Prick holes with a fork all over the pastry and place a piece of parchment and some weights on top. I used some dried pasta as weights. This will stop the pastry from forming bubbles when you cook it. This method is called baking blind and you can read more about it here. 7. Place in the oven for 10 minutes, then remove the weights and return to the oven to cook for a further 15 minutes. 9. Melt the white chocolate in a bowl over a saucepan with boiling water. Alternatively, you can melt it in a bowl in the microwave at 20-second intervals until all melted. 10. Then pour HALF of the melted white chocolate on to the base of the cooked pastry case. 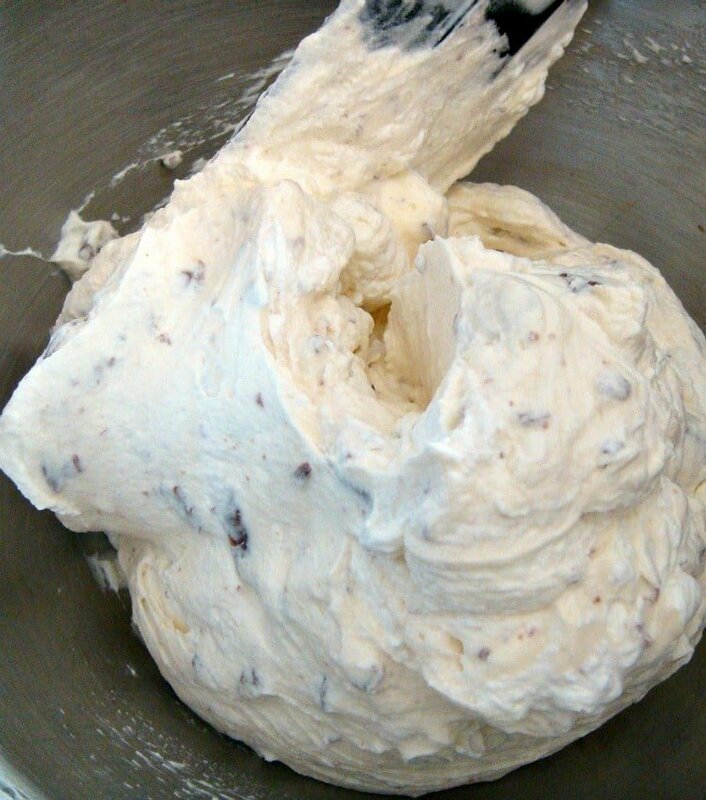 This will stop the pastry becoming soft or soggy later, and also adds an extra touch of flavor. Allow to chill in the fridge or freezer whilst you make the filling. 11. 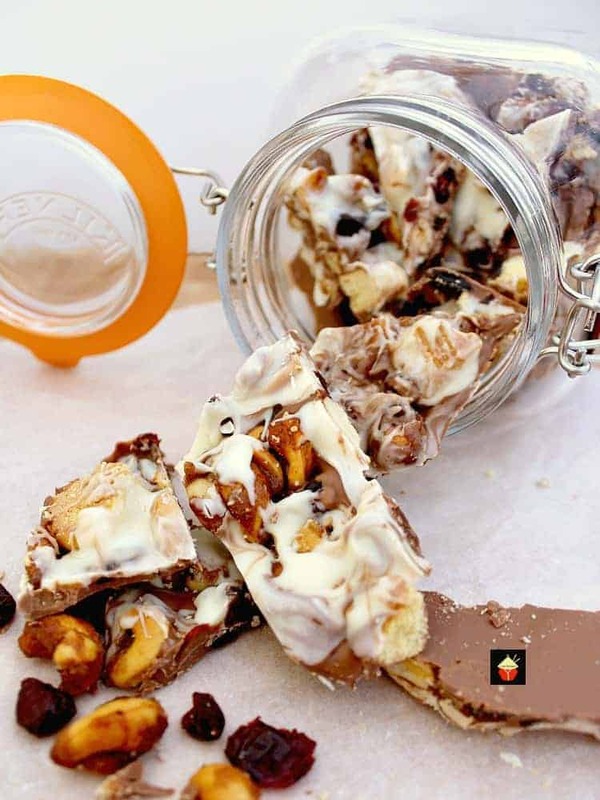 Chop the milk chocolate into small pieces and set aside. 12. In a mixer, beat the cream cheese, powdered sugar, Irish Cream and the other half of the melted white chocolate until light and fluffy. Fold in the milk chocolate pieces. 13. In a separate bowl, whip up the cream until stiff. 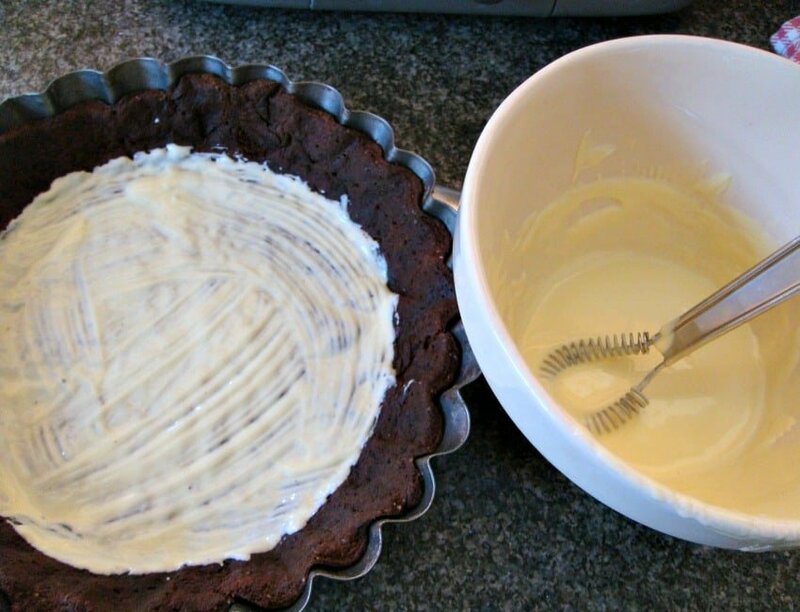 Then fold in the whipped cream to the cream cheese mixture, gently keeping it nice and light. 14. Add the filling to the pie case, smooth over the top and allow to chill in the fridge for 4 -6 hours. 15. When ready to serve, decorate the top how you like. I used some Irish Cream truffles to decorate. They were delicious! You can add some grated chocolate or other decorations as you wish. Serve after dinner chilled with a glass of Irish Cream or a nice coffee and enjoy! 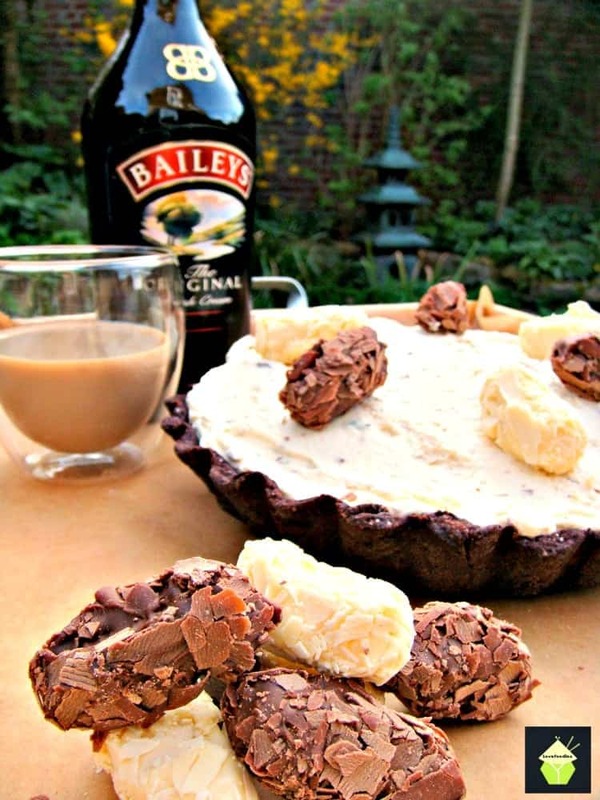 We’d love to hear from you and what you thought of our Silky Irish Cream Pie recipe. Did you make any changes or add some other goodies? Let us know in the comments below. Thanks for reading and happy cooking! 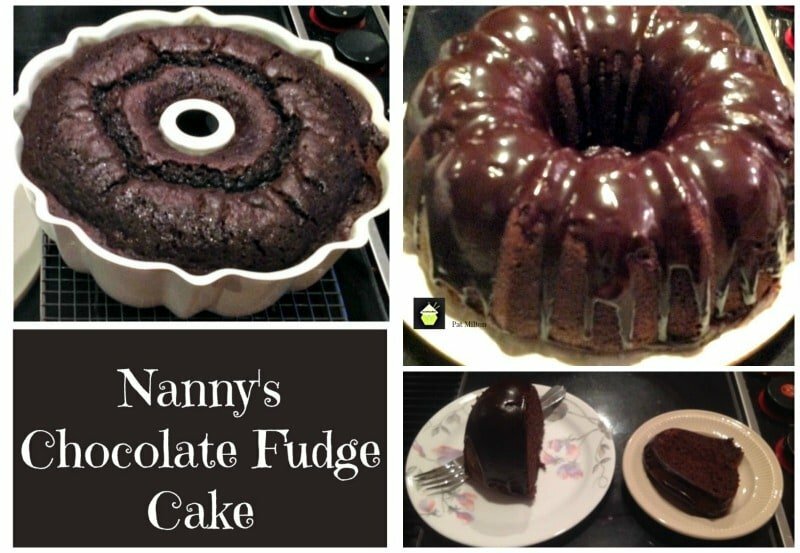 Nanny’s Chocolate Fudge Brownie Cake – perfect for sharing with friends! t *** If you don' want to make the base you can buy a ready cooked 9 inch pie crust, try and get a chocolate one if you can. It makes all the difference! Make your shortcrust pastry. Click here for instructions. You need to add the cocoa powder and sugar to the mix. Grease your flan dish & make sure you grease up the sides too. Roll out the pastry into the shape of your flan dish. Make sure there is enough to reach up the sides of your dish. I just place the dish over the pastry to see if I've rolled enough. Use your rolling pin to transfer the pastry to the dish. Prick holes with a fork all over the pastry and place a piece of parchment and some weights on top. I used some dried pasta as weights. This will stop the pastry from forming bubbles when you cook it. Place in the oven for 10 minutes, then remove the weights and return to the oven to cook for a further 15 minutes. Melt the white chocolate in a bowl over a saucepan with boiling water. Alternatively, you can melt it in a bowl in the microwave at 20 second intervals until all melted. Then pour HALF of the melted white chocolate on to the base of the cooked pastry case. This will stop the pastry becoming soft or soggy later, and also adds an extra touch of flavour. Allow to chill in the fridge or freezer whilst you make the filling. 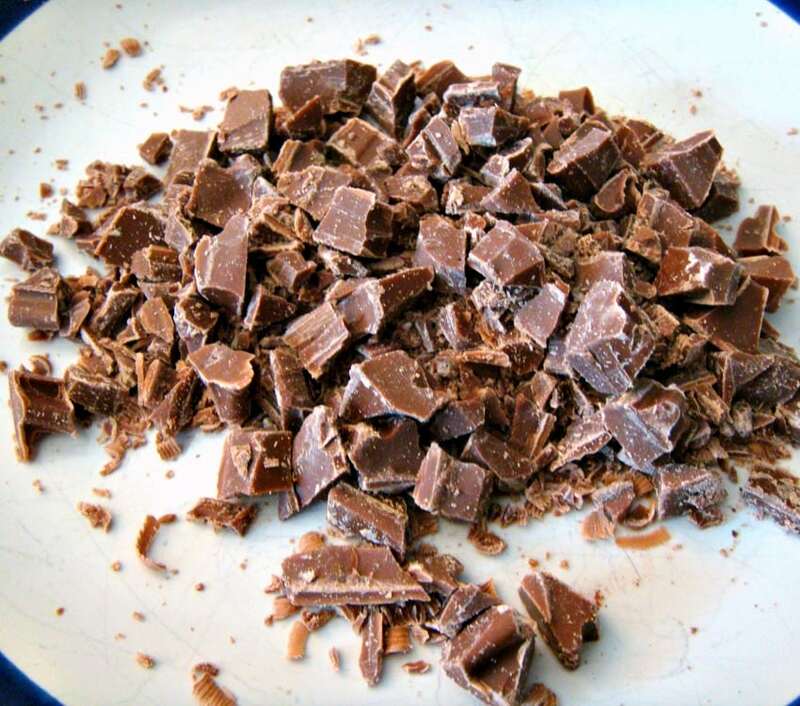 Chop the milk chocolate into small pieces and set aside. In a mixer, beat the cream cheese, powdered sugar, Irish Cream and other half of the melted white chocolate until light and fluffy. Fold in the milk chocolate pieces. In a separate bowl, whip up the cream until stiff. 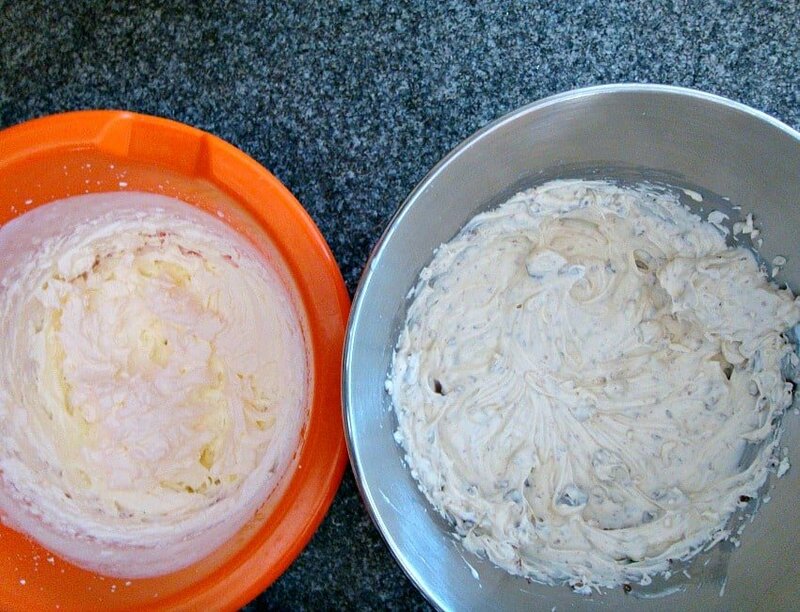 Then fold in the whipped cream to the cream cheese mixture, gently keeping it nice and light. Add the filling to the pie case, smooth over the top and allow to chill in the fridge for 4 -6 hours. When ready to serve, decorate the top how you like. I used some Irish Cream truffles to decorate. They were delicious!